Arr! It’s none another than meself, Planksy, the pirate turkey, the fowl come a calling, the bird with yer word, bringin’ and slingin’ me sparklers and sharklers, mateys, this Fourth of July. I sail in from across thee pond, 300 bird or so strong, after me European tour, with a treasure chest of good stories, a gobbler styled in the latest French fashion, an extra ho ho ho and a barrel of rum, no landlubbers there to a bird, from yer Amsterdam to Paris to London to Dublin. Arr! So yer know the drill. If yer get me sparklers, then let it be known throughout the Atlantic and Oklahoma that yer get a cup or twenty of me rum from me private edition barrel, Planksy’s Reserve, aboard me vessel. If it’s sharklers for yer, then a walkee walkee on the Planksy planky, and then do some swimming, landlubbers, no experience be required, with the fishies that come with a bit of a bite, if yer get me drift. Sparklers. Ahoy, Dr. Vic Hutchison, once again, come aboard me proud vessel and hoist rum cups with this bird as the sweet fiddlin’ plays a tune of yer liking. Aye, the good Doc Vic will give credit to others, a modest pirate professor, indeed, but he, others with Oklahomans for Excellence in Science Education and even more pirates, too, deserve a beauty of a full mast pirate parade for leadin’ the charge against the local politicians who be wantin’ the teachin’ of creationism in our schools. Doc Vic and company be doin’ this year after year after year for the sake of science, not of money. The scurvy, landlubberin’ politicos have been repelled for 15 years now. Arr! It’s a pirate’s dream be true. Sail on sea dogs, Vic and crew, sail on. Sharklers: Aye, yer basic pirate turkey hates to kick a bird (hee hee) when she’s down but sharklers it’s got to be for Janet Barresi, the state’s Schools Superintendent, who managed to make just about everyone think she’s a rascally bilge rat out for her own good and none other. It’s all for the kiddies, she keeps saying, the kiddies that and the kiddies this, but her system sets lads and lasses up for drownin’ in unreliable tests and forced into thinkin’ they be failures. Arr! Methinks the voters figured it all out when she lost her election in the 2014 electoral siege called The Battle of The Barresi, but let’s add a nice long plank aboard the Planksy’s Wrecked Again for a special topping to this glorious victory. Splashy splashy. Here come the toothie fishes. Hubris always makes them rascals a tad hungry. Sparklers. Arrrrr! That be yer five “r” arr. 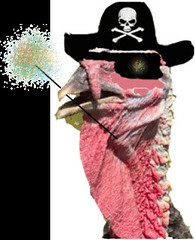 Aye, and I, fer one and all pirate turkeys and related species across the state, appreciate the campaign for U.S. Senate by state Sen. Constance Johnson, who tells it true as it can be in Oklahoma, no compromise, no wishy washy, on the basic principals, like reducin’ jail time for non-violent offenders and legalizin’ and regulatin’ cannabis. Can she win? Another pirate’s dreamy wish if my gobbler ever did see one, but she and pirate turkeys and their supporters have no reason for doldrums. Have some pirate fun and be makin’ a point. The barrel aboard ship, now docked at the Bricktown Canal, awaits yer arrival, the esteemed Senator Johnson. I bow to your courageousness and style, with my gobbler in a flutter. Sharklers. Sharklers galore go to the scurvy millionaire and billionaire big-shot executives from the Devon, Continental Resources and Chesapeake energy companies here in Oklahoma City. Arr! Methinks I smell some rascally stench from down below deck. What these bilge rats wanted and got were tax breaks for their companies because many a big-shot executive knows paying taxes be a fool’s game and plundering be a sure thing to get yer doubloons in Oklahoma where the conservatives are the captains of the political ship. Arr! But we create so many jobs, they cry in their grogs, but they be all quiet like about how they line their OWN pockets with doubloons. The science types also say the oily and gassy related companies are responsible for all these new earthquakes, but state leaders won’t do nuthin’ about it. The plank awaits yer arrival, me executives. The fiddler has a special tune for yer as well as you be makin’ the leap. Before the splash, can yer hand over some treasure for those school kiddies Janet wants to flunk so bad? Sparklers.The famous annual sharkler and sparkler award ceremony would not be complete without me mentioning the fowl who be just returnin’ from France, the bird with the beautiful gobbler that just recently swayed seductively in the Dublin breeze aboard me vessel as I crossed the sea. That would be meself, the world’s best connoisseur of tofurkey and barrels of rum. Enjoy your Fourth of July holiday and be careful at yer local turkey crossin’.